Quo Vadis (a Latin phrase meaning "Where are you going?") is a 1951 American epic film made by MGM in Technicolor. It was directed by Mervyn LeRoy and produced by Sam Zimbalist, from a screenplay by John Lee Mahin, S. N. Behrman and Sonya Levien, adapted from the classic novel Quo Vadis (1896) by Henryk Sienkiewicz. The novel had previously been made into an Italian film Quo Vadis (1924). The music score was by Miklós Rózsa and the cinematography by Robert Surtees and William V. Skall. The title refers to an incident in the apocryphal Acts of Peter; see Quo vadis? The film stars Robert Taylor, Deborah Kerr, Leo Genn, and Peter Ustinov, and features Patricia Laffan, Finlay Currie, Felix Aylmer, and Abraham Sofaer. Sophia Loren and Carlo Pedersoli were both cast in the movie as uncredited extras, and Sergio Leone worked on it as an assistant director of the Italian company. The action takes place in ancient Rome (with events of the last four years of Nero's reign (AD 64–68) being compressed within a few weeks or more), a period after Emperor Claudius' illustrious and powerful reign, during which the new corrupt and destructive Emperor Nero ascends to power and eventually threatens to destroy Rome's previous peaceful order. The main subject is the conflict between Christianity and the corruption of the Roman Empire, especially in the last period of the Julio-Claudian line. The characters and events depicted are a mixture of actual historical figures and situations and fictionalized ones. The film tells the story of a Roman military commander, Marcus Vinicius (Robert Taylor), who is also the legate of the XIV Gemina, returning from the wars, who falls in love with a devout Christian, Lygia (Deborah Kerr), and slowly becomes intrigued by her religion. Their love story is told against the broader historical background of early Christianity and its persecution by Nero (Peter Ustinov). Though she grew up Roman as the adopted daughter of a retired general, Aulus Plautius (Felix Aylmer), Lygia is technically a hostage of Rome. Marcus persuades Nero to give her to him for services rendered. Lygia resents this, but still falls in love with Marcus. Meanwhile, Nero's atrocities become increasingly more outrageous and his acts more insane. When he burns Rome and blames the Christians, Marcus goes off to save Lygia and her family. Nero captures them and all the Christians, and condemns them to be killed in the arena. However, Marcus's uncle, Petronius (Leo Genn), Nero's most trusted advisor, warns that the Christians will be made martyrs and, tired of Nero's insanity and suspecting that he might become a victim of his antics too, commits suicide by slitting his wrist artery, sending Nero a farewell letter in which he finally communicates his derisive opinions he had never been able to tell the emperor in fear of his own life. Marcus is arrested for trying to save Lygia. In prison, Saint Peter (Finlay Currie), who has also been arrested after returning to Rome upon a sign of the Lord, marries the couple; eventually, he is crucified upside-down as an ironic twist at the whim of Nero's guard. Poppaea (Patricia Laffan), Nero's wife, who lusts after Marcus, devises a diabolical revenge for his rejection of her. Lygia is tied to a wooden stake in the arena. A wild bull is also placed there, and Lygia's bodyguard giant, Ursus (Buddy Baer) must try to kill it with his bare hands, otherwise Lygia will be gored to death. Marcus is tied to the spectator's box and forced to watch, much to the horror of his officers, who also attend the spectacle. When all seems hopeless, Ursus is able to break the bull's neck. Hugely impressed by Ursus's courage, the crowd exhorts Nero to spare them, which the emperor is not willing to do. However, Nero's four other retainers Seneca (Nicholas Hannen), architect Phaon (D. A. Clarke-Smith), Lucan (Alfredo Varelli), and Terpnos (Geoffrey Dunn) vouch for the mob's demands by putting their thumbs up as well. Marcus then breaks free of his bonds, leaps into the arena, frees Lygia with the help of his loyal troops from his legion, and announces that General Galba is at that moment marching on Rome, intent on replacing Nero. The crowd, now firmly believing that Nero, and not the Christians, is responsible for the burning of Rome, revolts. Nero flees to his palace, where he strangles Poppaea to death, blaming her for attempting to scapegoat the Christians. Then Acte (Rosalie Crutchley), a palace slave who was once in unrequited love with Nero, appears and offers to aid him in ending his own life before the mob storms the palace. The cowardly Nero cannot bring himself to do it, so Acte drives the dagger into his chest, weeping over his demise. The musical score by Miklós Rózsa is notable for its attention to historical authenticity. Rozsa incorporated a number of fragments of ancient Greek melodies into his own choral-orchestral score. New recordings were made by Rózsa with the Royal Philharmonic Orchestra (1977) and by Nic Raine, conducting the City of Prague Philharmonic (2012). Composer Bernard Hermann called it "The score of a lifetime." At the end of the film, a triumphal march heralds the success of the armies of future emperor Galba. This theme would be re-used by Rózsa in Ben-Hur (1959) as the music accompanying the parade of the chariots around the track, prior to the famous chariot race. The film was originally cast in 1949 with Elizabeth Taylor as Lygia and Gregory Peck as Marcus Vinicius. When the production changed hands the following year, the roles went to Deborah Kerr and Robert Taylor. Elizabeth Taylor was also a Christian prisoner in arena, but uncredited. Sophia Loren briefly appears uncredited as a slave. The Italian actor Bud Spencer also had an uncredited extra role as a Praetorian Guardsman. The film holds a record for the most costumes used in one movie: 32,000. The film was shot on location in Rome and in the Cinecittà Studios. Peter Ustinov relates in his autobiography, Dear Me, that director Mervyn LeRoy summarized the manner in which he envisioned Ustinov should play the Emperor Nero, very salaciously, as "Nero...He plays with himself, nights." Ustinov, getting the director's gist, thereafter notes that this depraved manner was the basis of his creation of the character of Nero for the film. Also according to Ustinov, the film was originally slated to be directed by John Huston. Ustinov screentested with Huston before the production changed hands. At one point in the film Nero shows his court a scale model illustrating his plans for rebuilding Rome. This model was originally constructed by Mussolini's government for a 1937 exhibition of Roman architecture—the film's producers borrowed it from the postwar Italian government. The first usage of the phrase 'Hollywood on the Tiber', which has since come to refer to a golden era of American runaway film production in Italy was used as the title of an article in the June 26, 1950 issue of Time. The film was a commercial success. According to MGM records, during its initial theatrical release it earned $11,143,000 in the US and Canada and $9,894,000 elsewhere, making it the highest-grossing film of 1951, and resulting in a profit to MGM of $5,440,000. 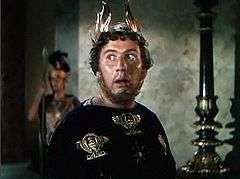 Quo Vadis was nominated for eight Academy Awards: twice for Best Actor in a Supporting Role (Leo Genn as Petronius and Peter Ustinov as Nero), and also for Best Art Direction-Set Decoration, Color (William A. Horning, Cedric Gibbons, Edward Carfagno, Hugh Hunt), Best Cinematography, Color, Best Costume Design, Color, Best Film Editing, Best Music, Scoring of a Dramatic or Comedy Picture, and Best Picture. However, the movie did not win a single Academy Award. Peter Ustinov won the Golden Globe Award Best Supporting Actor. The Golden Globe for Best Cinematography was won by Robert Surtees and William V. Skall. The film was also nominated for Best Motion Picture – Drama. A 2-Disc Special Edition of the movie was released on DVD in the US on November 11, 2008, after a long photochemical restoration process. A high definition Blu-ray version was released March 17, 2009. ↑ "Quo Vadis (1959) IMDb Movie Connections page "Referenced In" section". Internet Movie Database. Retrieved 24 Aug 2015. ↑ Books.google.com. Books.google.com. Retrieved 2012-04-05. ↑ Books.google.com. Books.google.com. 2006-09-14. Retrieved 2012-04-05. ↑ "NY Times: Quo Vadis". The New York Times. Retrieved 2008-12-21. ↑ "AFI's 100 Years of Film Scores Nominees" (PDF). Retrieved 2016-08-19. ↑ "AFI's 100 Years...100 Cheers Nominees" (PDF). Retrieved 2016-08-19. ↑ "Quo Vadis Two-Disc Special Edition: Restored and Remastered Classic Finally Comes to DVD November 11 from WHV". Business Wire. Retrieved 2016-01-15. Wikimedia Commons has media related to Quo Vadis (film).